Up to two thousand pounds in weight and over ten feet tall, the bear is considered the biggest and heaviest terrestrial carnivore in the world. Of course, there is not just "one bear"; on the contrary, there are plenty of subspecies that differ from each other in various aspects. For instance, only the Kodiak bear (ursus arctos middendorffi) weighs about 2,000 lbs. The polar bear (ursus maritimus) weighs "only" 1,100 lbs., but gets much bigger than the Kodiak bear, being as much as 11 ft. tall! 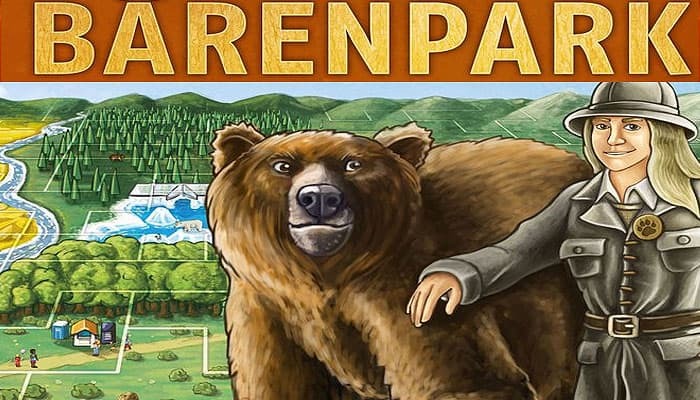 Bärenpark takes you into the world of bears, challenging you to build your own bear park. Would you like another polar bear enclosure or rather a koala* house? The park visitors are sure to get hungry on their tour through the park, so build them places to eat! 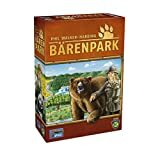 In more detail, each player in Bärenpark builds their own bear park, attempting to make it as beautiful as they can, while also using every square meter possible. The park is created by combining polyomino tiles onto a grid, with players scoring for animal houses, outdoor areas, completed construction, and more. The sooner you build it, the better! Cover icons to get new tiles and park sections. The game ends as soon as one player has finished expanding their park, then players tally their points to see who has won.